Built originally in 1779 as the Hynes Hotel, the building was close to a stagecoach, stop making it a popular place where travelers and locals could eat a meal and get a night’s rest. Back then you could rent a bed, not a room. People who came to stay at the Hotel had to share their room with someone else. Over the years, Presidents such as Abraham Lincoln, William Harry Harrison and Andrew Jackson as well as other notable men such as Daniel Boone and Henry Clay visited. Infamous outlaw Jesse James even made an appearance or two. Jesse James was related to the jailer in the mid-19th century and used to come to Bardstown to visit and lay low. Bardstown was off the grid and locals didn’t care much for another guy who just seemed to be passing through town. 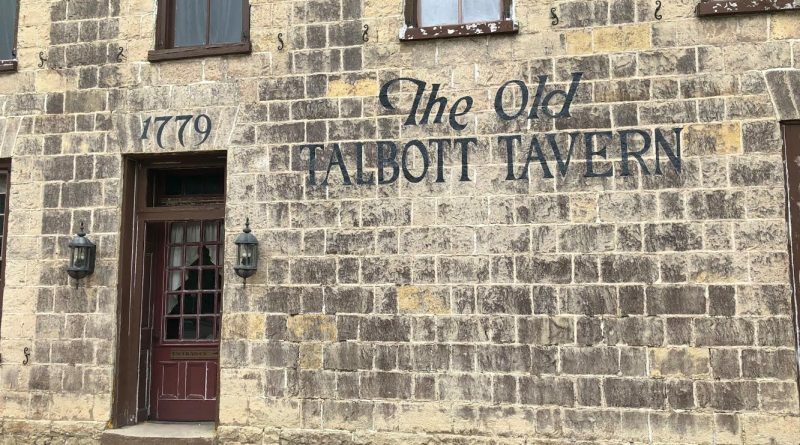 To pass the time, James would come to the Talbott Tavern. One night James got really drunk and started shooting at invisible butterflies. The bullet holes are still in the wall. In 1886, George Talbott bought the hotel and called it Talbott’s. As the business flourished in the late 19th century, dark days were ahead as two of George’s children died in the building. In 1998, Talbott’s caught fire and shut down for a year and a half. Employees are convinced that the building is haunted. Former employees talk of seeing the apparition of a man in a long coat which is thought to be Jesse James. A woman has also been spotted in the building and doors mysteriously open and shut on their own. People also talk of hearing strange music, voices talking and footsteps late at night. The second floor of the Tavern is a hotbed of activity. Shadow people have been spotted there, and locals swear that they see people looking out the windows late at night when Talbott’s has shut down. Strange things have also been experienced in the bathrooms as well. Lights turn themselves off and on, and the hand dryers come on at random. For more on the Talbott Tavern and other places in Bardstown check out the Louisville Ghost Map in the iTunes App Store. With over 60 haunted places around Louisville to explore there is a lot of ghost hunting to do.